Controversial topic alert! If you want to start a heated debate at your next writing group, ask if you should include a prologue in your novel. Many writers love prologues, but many readers (and therefore agents) aren’t keen on them. There’s no one-size-fits-all here, so let’s take look at both sides. A prologue is different from an author’s note, a preface, an epigraph, and a forward. A prologue acts as an introduction to your story, as a sort of appetizer to the main course that is your novel. First let’s review some reasons to avoid a prologue. Many readers just skip them. I’m sorry to be the one to tell you this. In my completely unscientific poll of five avid readers, none read prologues. One reader said that he finds them to be more confusing than illuminating. You want to create “atmosphere.” Some writers (especially fantasy and science fiction writers) use the prologue to set the stage of the story. Why do we need a separate section for this? Setting and mood should be infused into each page of your novel, not something to prepare the reader for. None of the above reasons are solid enough on their own to give rise to a prologue. If the reader truly needs this information, why isn’t it in the main novel? Share critical information that occurred well outside the time frame of the main story. (Note the word critical.) It is usually not desirable to stop the forward momentum of your main story to include an event that happened in another era, likely with other characters. A prologue can present this information without distracting from the action in the present day. Foreshadow what is to come. While you wouldn’t want to include the novel’s inciting incident in the prologue, you can entice readers by hinting at the event or its aftermath. Introduce the villain. For those of you writing in genres with a clearly defined antagonist, the prologue can be a good place to introduce this character, showcasing the villain’s evilness or offering a glimpse into the villain’s humanity. Including the inciting incident. The prologue should not contain the key moment that sends the main characters on their journey. Now, here is the tricky part—the prologue should move the story forward. It should have an impact on the main plot, but it shouldn’t be the moment that changes everything for the characters. It’s just too long. While there is no hard-and-fast rule about the length of a prologue, it’s time to re-evaluate if yours is beyond five pages. Readers will become impatient and want to start the story already. The prologue doesn’t fit the tone of the story. I’ve read prologues that feel as if they were lifted from another novel. Maybe the prologue language is poetic and flowery while the main novel is straight forward. Or the prologue introduces a character as contemplative while in the main novel he is snarky and sharp. What information am I providing to the reader? Is it necessary? Really necessary? What is the purpose of my prologue? What do I want the reader to take away from it? Why do I need to reveal these details separately? Could I include them within the main story? Have you included a prologue in your novel? 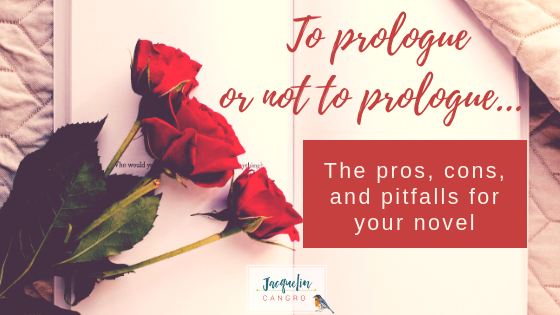 As a reader, how do you feel about prologues? Starting January 2019! I am developing a 31-Day Editing Challenge as a helpful guide to get you off on the right foot as you edit your novel, memoir or short story. Whether you’re on your first draft or your fifth, we will explore the basics of developmental editing. My goal is to help you approach your manuscript in a new way and keep your momentum going. I hope you will be interested in joining me. It’s FREE! Learn more here and get on the list! Your timing is perfect! I just finished reading Kate Morton’s THE CLOCKMAKER’S DAUGHTER. It begins with a prologue of sorts — not named as such, rather given a Roman numeral and then Chapter One follows. The Roman numerals poke in another eleven times. These represent the voice of the narrator, to distinguish her presence as a third-person narrator, these prologues are distinctly the narrator’s story. The ghost serves to guide the reader for over 150 years, over nearly 500 pages, and a multitude of characters whose stories and themes connect over centuries. The prologue also sets a mysterious tone. But I wondered whether there was another literary technique for accomplishing all this? Whether the ghost could appear in the novel versus the approach Morton took. The prose flows beautifully, so I loved it. But do literary agents like this approach? Guess it depends? Perhaps you’ll read it sometime, and enlighten! I just read your review of The Clockmaker’s Daughter. It sounds like a wonderfully complex and detailed story. 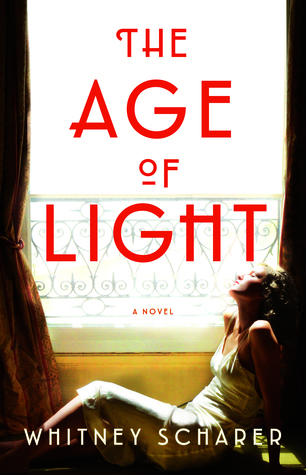 It takes a skilled writer to weave so many time periods and characters into a cohesive story. I’m definitely going to add this to my list. Thank you for sharing!